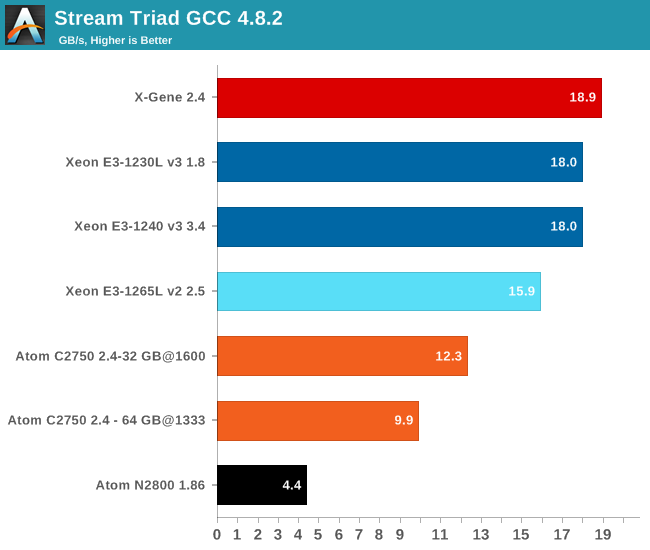 While the Xeon E5 has ample bandwidth for most applications courtesy of the massive quad-channel memory subsystem, the Xeon E3 and Atom C2000 only have two memory channels. The Xeon E3 and Atom C2000 also do not support the fastest DRAM modules (DDR3-1600, Xeon E5: DDR4-2133), so memory bandwidth can be a problem for some applications. To keep things simple, we only report the Triad sub-benchmark of our OpenMP enabled Stream benchmark. First of all, we should note that the clock speed of the CPU has very little influence on the Stream score. 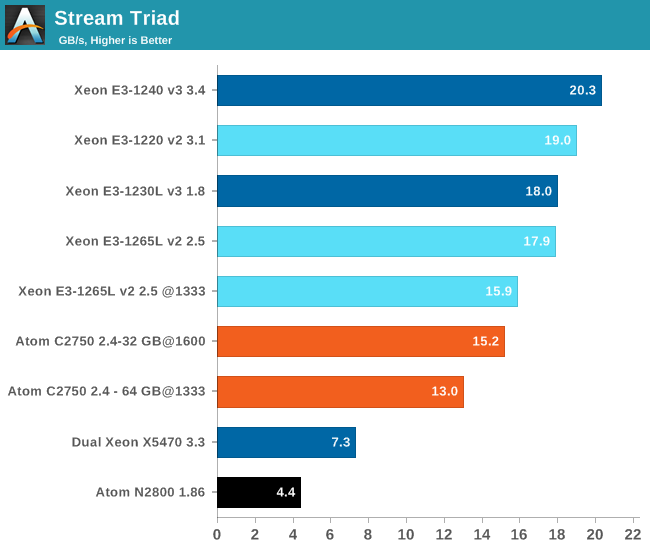 Notice the small difference (12.7%) between the Xeon E3-1240 that can boost to 3.6GHz and the Xeon E3-1230L that is limited to 2.3GHz (Turbo Boost with four cores busy). The Xeon E3-1200 v3 is slightly more efficient than the Xeon E3-1200 v2; we measured a 7% bandwidth improvement. The Xeon E3 also offers up to 33% more bandwidth than the Atom C2750 with the same DIMMs. To do an apples-to-apples comparison with the X-Gene 1, we compiled the same OpenMP enabled Stream benchmark (O3 –fopenmp –static). The Xeon E3 has the most efficient memory controller: it can extract almost as much bandwidth as the quad-channel memory controller of the X-Gene and about 46% more than the Atom. Our guess is that the X-Gene still has quite a bit of headroom to improve the memory subsystem. There is work to be done on the compiler side and on the hardware. AMD doesn't even make it in top 10 semiconductor companies in sales. Qualcomm is three, Samsung semicondutors six and Intel almost ten times the size of AMD. Qualcomm is used in pretty much used in most cell phones in the US to the point you'd think Qualcomm is the only SoC manufacturer. I'm pretty sure that's also how it looks in most of the other markets as Korea. Plus even if their SoCs aren't being used, they're modems are heavily used. Qualcomm's next major competitor is Apple. But that's about it. Bear in mind that the Atom parts were commercially available in 2013, so they are by no means brand-new technology and the 14nm Atom upgrades will definitely help power efficiency even if raw performance doesn't jump a whole lot. 14nm server Atom isn't coming.